How do you learn about the past? Where can we find things that relate to history? Books...museums, perhaps? A lot of children these days learn about history in school or by reading things in books. Increasingly, we're learning much of what we know about the past from the internet and television as well. While Scottish Gaelic also has a great literary tradition, Gaelic culture in Nova Scotia was and remains, for the most part, oral. That means that knowledge of the past, songs and stories were and are listened to and retold by those that heard them without ever writing anything down or reading it. In Gaelic, we say Bho Ghlùin gu Glùin or "From Knee to Knee", meaning that knowledge is passed down much like a parent telling a story or teaching a child on their knee, a child that might one day have a child on their own knee to teach. The céilidh or "visit" is a time when stories are told, songs sung and information shared. Gaels' memories were well developed and some stories that were told dated back centuries. Children hear of battles, magic and tragedy that might have occurred a long time ago but is still in, some ways, important. Jokes are told about people who lived over a hundred years ago as if these people were still in the community today. We can say, then, that that these stories, and even songs acted as a record of the past. Of course, this record we have of the past from the Gaelic oral tradition is kept interesting by adding bits of fantasy - magic, or other-worldly happenings that make stories more interesting to listen to and memorable. By keeping the past alive in storytelling and song, history is not just about things that happened long ago but is still very much a part of people's lives in the present. The following is a translation of an account of the exploits of Donald "Gorm" (Blue) MacDonald, a real historical figure who fought with the British against the French in the final Siege of Louisbourg in 1758. Many stories were told about Donald Gorm in Nova Scotia and in Scotland. He was said to be a ruthless captain who committed many horrible deeds, both on the battlefield and elsewhere. When the French first came to Cape Breton they built a large settlement at Louisbourg and constructed a fortress around it. There was already a large British settlement in Halifax and the British were envious of the French position at Louisbourg as it was close to the entrance of the Saint Lawrence River - the gateway to the continent of North America. 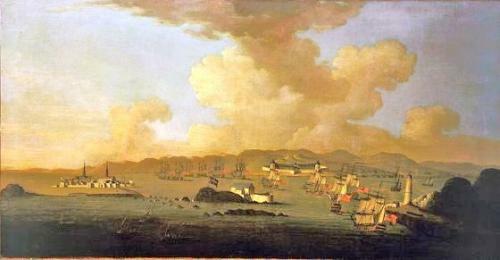 In 1758, the British decided that they were going to capture the fortress of Louisbourg. That is indeed what happened and after most of the British fleet returned to Halifax or Britain, they left behind a ruthless captain by the name of Donald Gorm MacDonald to kill any of the remaining French. Donald Gorm set out to comb Cape Breton for any remaining French. He came upon the house of a some Gaels - a widow and her three sons. Donald Gorm took two of the sons to fight with him but left the third son, as he was disabled. It wasn't long before Donald Gorm returned to the widow's house and informed her that the first two sons had died in battle. This time, he was coming for the widow's third son. The widow asked what use her disabled son would be in battle but Donald Gorm simply told her that he would, "blacken the battlefield and that all would perish in the ashes." To this the widow stated, "The disabled boy will return, but you, Donald, will never return." With that, Donald Gorm left with her third and last son. Donald Gorm, the boy and other soldiers continued on their march and finally rested and made a camp near the shore. One soldier kept watch over Donald Gorm's tent each night but in the morning, he would be found dead. A new soldier was chosen each day and the next morning, would as well be dead. It fell upon this one man to serve as guard for Donald Gorm. He blessed himself and began his duty. Around midnight, the soldier heard a strange noise and there appeared a pig all covered with chains. The pig approached the terrified soldier and exclaimed, "I am Donald Gorm. You are lucky that you have blessed yourself as I would have certainly killed you. It was the widow who cursed me to remain in this state for the rest of eternity." And, indeed, that is how Donald Gorm remains to this day. Told by Joe Lawrence MacDonald, Boisdale, and recorded by Dr. John Shaw. In reality, Donald Gorm was killed in battle in Quebec in 1760. Can you think of any real historical figures that appear in stories of myth and fantasy? The widow in Joe Lawrence's story was said to be a Gael, but this is odd as Gaels did not start coming to Nova Scotia until 1773. Similar stories about Donald Gorm exist in Scotland and one has the widow living on the island of Sandray, just south of Barra. A song was made, supposedly about by the widow herself. It is still sung in Nova Scotia and Scotland till this day. Iùraibh o, I am not well. Hug orainn o, I cannot rest. I am sad cutting flax, the tears from my head are streaming to the ground. If you dealt with me unjustly, Blue Donald, I treated you like the other women. I treated you as your sister did, perhaps even better. I did not ask God to destroy you although you betrayed my household. Although you gave me a croft, I gave you a more valuable gift. Although you took the three from me, their father is dead in the ground. Although you gave me a golden coin, the group that went forth to battle was more precious. You took John and Donald, and Alasdair of the fair ringlets, from me. If you had left Hector with me, I would not have complained so much about the others. It would have been better for you to have taken the cattle from the glen than to have to face the piercing cries of woe from widows about their families. It is a pity that I could not assume the shape of a seagull, then lightly would I swim away. I would swim over the sea in order to find out whether the boys were treated well. It is a pity that I could not see four men in a boat approaching the shore. Four of my beloved companions who would depart gladly with the oars. And if you understood my cause of grief, you would put the boat to sea. I would rather put the galley to sea to which would be hoisted the tall sails. And if my feet could touch the bottom of the deep, I would not remain on this land. It is the separation of the men from each other that has left me depressed each day. Parting from John and Donald has shed my tears with good reason. May the blessing of God follow you, Hector, you were my choice over all others. I shall now proceed forward whilst the tears from my head are streaming to the ground. Click to listen to the song being sung by Jimmy "Caluman" MacNeil of St. Columba. Recording courtesy of Féis an Eilein. The Gaelic version of the song can be found in Helen Creighton's Gaelic Songs in Nova Scotia p. 112. Plot of land to work and build a house on.